…as deceptively thick yet brutally delicate as winter ice itself…Indeed, for all its harsh observations about human nature, this novel has at its heart a strong belief that love, for all the pain it brings, is the one thing that truly saves us. Heart-stopping and heart-wrenching…Like a current, Johnston’s story sweeps us in and doesn’t let go. 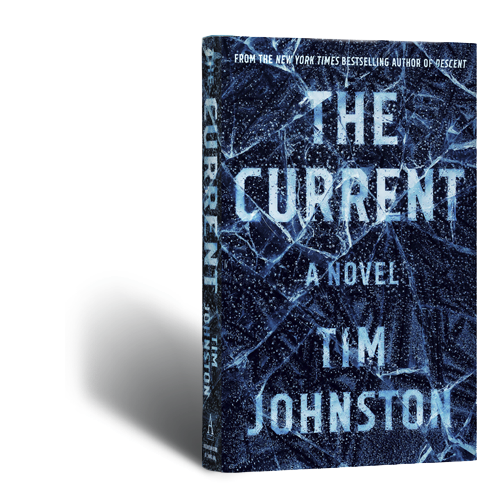 Tim Johnston’s second novel, The Current, is even better than his first, which is saying something. How the hell did he write an even better book than Descent? …the timeliness of the subject matter, the sense of place, the careful attention to every detail and the flawed and empathetic characters…I am motivated to break my record of selling 100 copies of a hardcover book without an author event! I simply had to give this one all the stars……the mighty 5-Star medal of honor…it’s his uncanny ability to hone his characters into believable, raw, achingly human individuals who tread the high roads of life as well as the dark, foreboding roads, too. ..this novel is full of believable and sympathetic characters whose stories intersect and unfold in a natural way that keep the reader hanging on. The grief is raw and isolating and I found myself aching for justice and closure…definitely a must read! This will be the Three Billboards Outside Ebbing, Missouri of the book world, and I hope it actually wins the prizes! Another freezing mystery from Tim Johnston, this time on the border of Minnesota and Iowa. So much fun! Johnston creates people you can believe in, with all their conflicts and confusions and sorrows…Maybe ‘thriller’ is the wrong name for what he’s created. It’s an awfully good novel of any genre. Johnston has quickly become my favorite writer in this genre, and his books are perfect for thriller readers who want a bit more substance to their stories without sacrificing suspense. Johnston imbues each character with believable motives. The nuanced plot delves deep into how a community—and surviving relatives—deal with the aftermath of a death. The characters, thrown together by acts of violence, reveal a vulnerability that is more powerful and more engrossing than the crime itself—steering his readers toward a powerful message around humanity. …a gripping thriller and page turner but also a masterwork of mood and language…You’ll want to go fast at the same time you’ll be compelled to savor each and every word. I don’t usually rate suspense novels this high, but Johnston’s…use of language is lovely, his characters are fully drawn, and he knows how to build suspense and keep readers flipping pages. I liked this even better than his first novel. A page-turning mystery and a deeply moving story. If you read literary suspense, this is your book. If you are looking for a book you can’t put down, this is your book. If you need a story that will follow you for days, this is your book. …I would have taken a break long before 2:00 a.m. last night were it not for Johnston’s masterly ability to rummage inside the heads of his various characters…women and men fighting to free themselves of the legacy of those watery deaths, breaking up their iced-over emotions. Copyright © 2019 Tim Johnston.